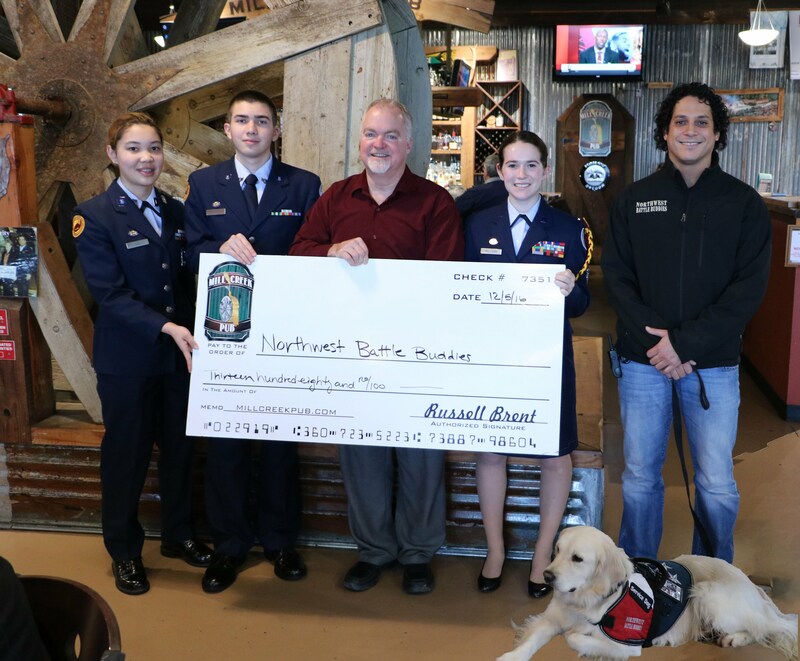 Prairie High School Air Force Junior ROTC cadets sponsored a charity drive to highlight and support Northwest Battle Buddies (NWBB), a nonprofit that trains and pairs service dogs with combat veterans who are living with the effects of post-traumatic stress disorder. The campaign ran from Nov. 1 to Nov. 11, culminating in a pancake breakfast on Veterans Day sponsored by Mill Creek Pub in Battle Ground. All veterans were invited to eat for free at the event, while the public was asked for a minimum donation of $5 to eat breakfast. All of the donations and proceeds collected from the breakfast were donated to NWBB. On Monday, Dec. 5, a check for $1,380 was presented to NWBB from Russell Brent and the cadets from Prairie High School. Special thanks to Russell Brent and Mill Creek Pub for supplying the food and workers from his restaurant to support our veterans! The cadets are Heather Lee, Nate Garate, and the Corps Commander Nikki Willson, along with Russell Brent and combat veteran Travis Cottrell with his NWBB dog, Ranger. Pictured from left to right are cadets Heather Lee, Nate Garate, Mill Creek Pub owner Russell Brent, Corps Commander Nikki Willson, and combat veteran Travis Cottrell with his NWBB dog, Ranger.